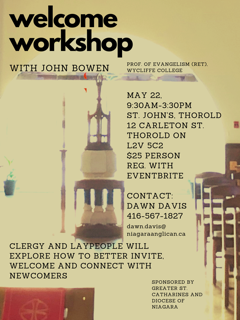 All are welcome to join in the exploration of how to better invite, welcome and connect with newcomers on May 22, 2019 from 9:30am to 3:30pm at St. John the Evangelist in Thorold (12 Carleton Street). Parishes are encouraged to send their clergy and four lay people to this workshop. There will be short presentations along with time for parish work and cross-parish sharing. Click here for poster. This event will be facilitated by John Bowen, professor of evangelism (retired) of Wycliffe College. Topics include: a) Why are we welcoming? b) Why would new people want to come? c) What is the impression new people have of our church? d) How are new people welcomed? e) What are the impressions new people have of our worship? f) What happens at the end of service? g) How do we follow up with new people? h) How do new people grow in faith? The cost is $25 per person (includes lunch). Click here to register. For more information, contact The Reverend Canon Dr. Dawn Davis at 416-567-1827 or by email. This event is sponsored by Greater St. Catharines and the Diocese of Niagara.